​community bands, professional musicians and private users. In Tune Music prides itself on providing reliable, punctual and high quality musical instrument repairs. 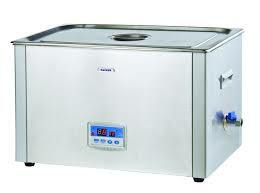 In Tune Music has a state of the art Ultrasonic cleaning bath. Ultrasonic cleaning is the single most effective cleaning method for metal parts. It can clean at the microscopic level inside surface holes that are smaller than a human hair. It is hygenic enough for hospital grade cleaning of surgical instruments making it suitable for properly cleaning new or second hand instruments. In Tune Music provides magnetic dent removal which is especially useful for dents in lower brass instruments. It allows dents to be removed without an unsolder/resolder process. This is more cost-effective and avoids silver/lacquer degradation protecting the finish on your instrument. Don't know where to start with finding a new or used musical instrument? Let In Tune Music assist you to find the best instrument for your level of proficiency and budget. Are you confident that the instrument you intend to buy is in good working order? In Tune Music can assist by evaluating the condition of the instrument you are about to purchase. This can help alleviate any concerns you may have. Will your school band's instruments be ready for the new year? The benefits of Instrument Boarding are that your school band instruments are serviced, hygienically cleaned for new band members and maintained in peak playing condition over the holiday break. This is designed to help preserve the value of your school’s assets. Instrument Boarding is suitable for a school band programme looking to maintain its instruments during school holidays so that they are fresh, clean and ready to go when school resumes. Privately owned instruments can also take advantage of this same service.